You found the dress - yay! Everytime I saw it in H&M I thought of you. I've tried it on too - and it did NOT look cute on me, but it looks gorgeous on you :-) I think the simple design offsets the bright color - you look lovely! I love this dress so much! I was scared of the color but it quickly grew on me :-) it looks so pretty on you and I love the necklaces! I love this dress and I really wish H&M would get thier online shopping going already. I think Ella is right the design does offset the bright color. It looks great on you and I love how you styled it. I think it's beautiful on you! A belt might help cut the color too. Love the necklace! It is a gorgeous color on you! I can be shy in social situations too -- but I find that a dress or accessory that's a conversation-starter TOTALLY helps! What a beautiful dress. I like how you wore gold with it. Looks great together. That's such a pretty dress and it looks amazing on you. I'm bummed I missed out on it. I got a similar one in orange, it's slightly low-high. Love the pink so much better. I love that dress! I have it too and did a blog posting on it: http://mandm24.blogspot.com/2012/06/neon-pink.html It's definitely much better than it looks on camera! Sorry I meant much "brighter" not better. Whoops! So cute! I almost bought that same dress, but didn't end up buying it (not sure why now)...you look great! I love pink on you, looks so gorgeous with your skin tone. I love it! You can definitely pull off shocking neon pink. It looks so great with your hair and skin tone! I agree that styling it with flats helps make the look more casual and barbecue-appropriate. 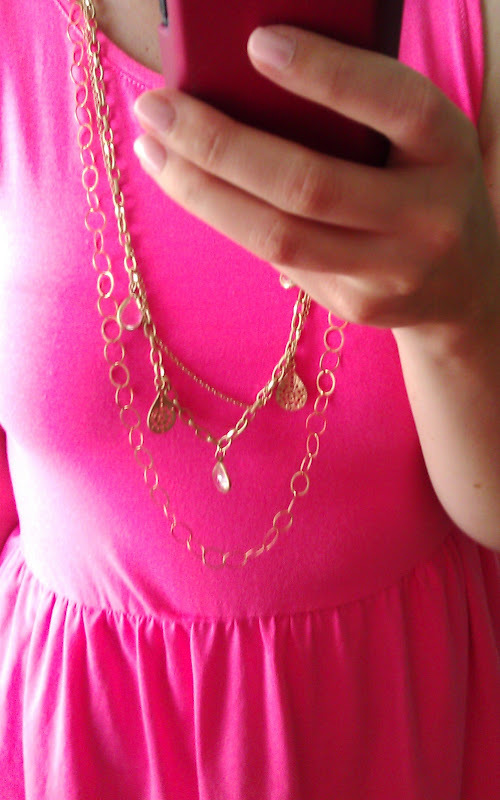 The bright pink looks great on you and I love the gold jewelry with it! Thank you for your comments and suggestions! I love the dress! What a great color! Love that color, my favorite!